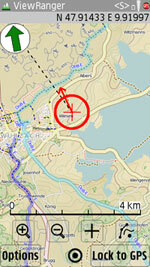 Viewranger GPS from Augmentra is now available to buy direct from Symbian App stores. With the addition of support for topgraphical mapping from OpenCycleMap and street map data from OpenStreetMap, Viewranger is now an app with global coverage. Map tiles can be downloaded for use in areas of poor network coverage. Premium map data can be purchased from thirteen national mapping agencies including Ordnance Survey in the UK, Bundesamt fur Kartographie und Geodesie (BKG) in Germany and National Geographic in the USA. "ViewRanger transforms smartphones into a powerful GPS, an essential app for any outdoor enthusiast"
Larry Berkin, Head of Global Alliances and GM USA, Symbian Foundation said, "ViewRanger transforms Symbian-based smartphones into a powerful GPS that makes it an essential app for any outdoor enthusiast and rescue team�. Unique features such as panoramic view and BuddyBeacon have made Viewranger a firm favourite and Augmentra are looking to expand with availability on other platforms planned. Viewranger is available from www.viewranger.com and from Nokia's OVI Store and Samsung Apps store with pricing starting at �4.00 (�5.00).